If your idea of getting adventurous with training gear is to adjust the height of a cable by one notch, it’s time to broaden your gear horizons. 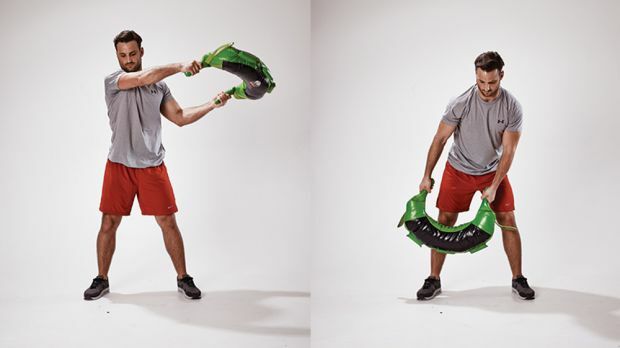 Look beyond barbells and machines and you’ll find a range of kit that will get you moving in a way that builds real-world strength and fitness. It’ll also give your brain a boost, by making your workouts more fun – which is one of the keys to sticking to your workout routine. 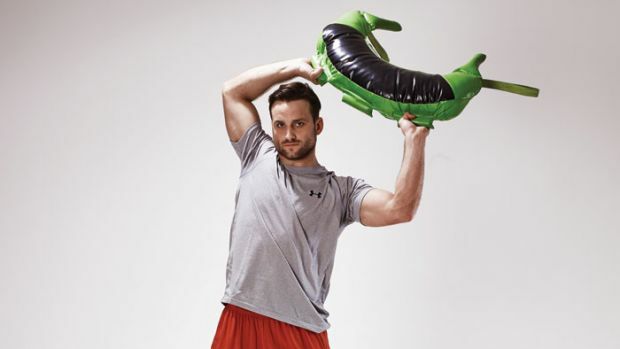 Using sandbags, battle ropes and Bulgarian bags is a great way to create a functional workout and introduce more variety to your training sessions so you avoid getting bored. 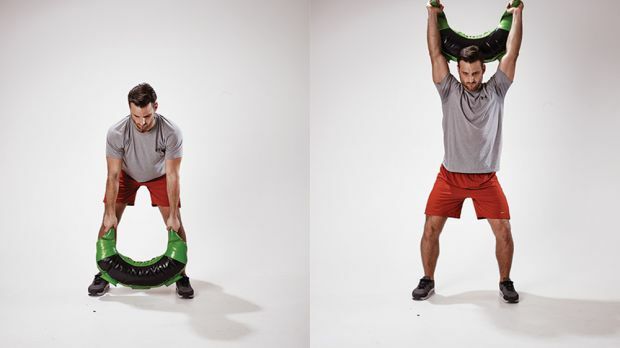 The Bulgarian bag will work muscles such as the rear delts that often get forgotten about. The rotational element will also help to open up the shoulder girdle and maintain a healthy shoulder joint. Doing moves that involve grasping the bag’s handles will also improve your grip strength, which is often your body’s weak link. If you improve your grip strength you’re likely to see improvements to strength moves such as deadlifts. For a full-body cardio workout, string the exercises below into a circuit, doing each move for 30 seconds and completing three rounds, and bag improved endurance, core strength and grip. The bread and butter of the Bulgarian bag. It’s a fantastic exercise to open up the shoulders and create a stronger core and spine. What I really like about this exercise is the dynamic range of motion and intensity you can hit. As you build momentum, open up your shoulder girdles and squeeze your glutes, keeping your torso upright. Drive the momentum with your hips as you open up your shoulders. Hold the bag overhead and rotate it around your head. When you finish a rotation in one direction, switch directions. Good rotation strength should be fundamental in everyday life to keep a healthy spine – especially among people who regularly exercise. This exercise will work the obliques and the shoulders in a very simple side-to-side movement. Focus on strong breathing in through the nose and out through the mouth as you rotate side-to-side. As you build momentum, remember to twist your torso. Grab the bag by both handles and swing it around in front of you in a circle, dipping slightly at the knees as it goes through its lowest arc. Keep a steady pace, and change direction after 15 seconds. This is a more advanced variation of the rotational swing because you are still using the obliques and shoulders. With the lateral, when building momentum and twisting, you drive your hips back into a squat, keeping your torso upright. What I love about the Bulgarian bag is that if your form is on point, it really is the pinnacle of functional training. 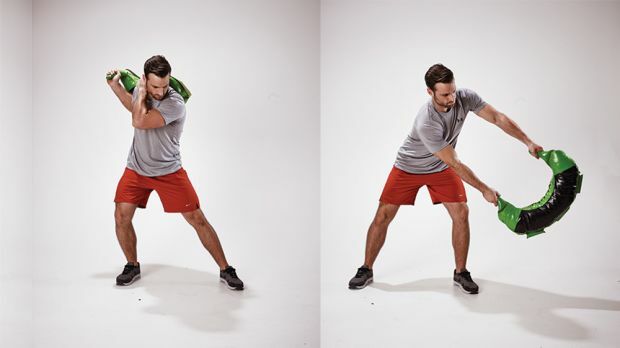 Swing the bag up to your shoulder, then step to one side slightly and swing the bag to that side, as if you’re swinging a scythe (if you’ve ever done that). This is similar to the kettlebell swing. 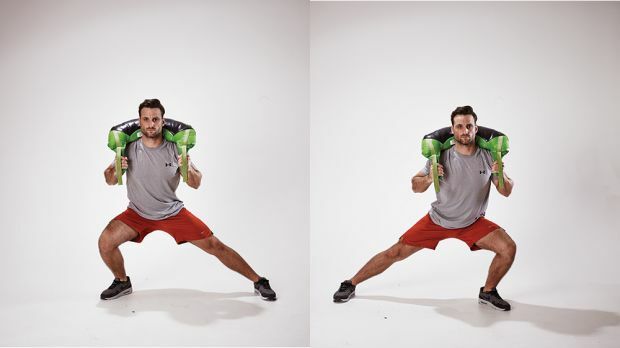 The Bulgarian bag swing to squat works the glutes, hams, core and shoulders big time. It is relatively easy to perform and can actually aid people in getting into a deep squat by creating a counterbalance. Like a kettlebell swing, the movement comes from the hip hinge and driving the hips back into the squat as you build momentum. Keep your torso upright as you perform the squat. 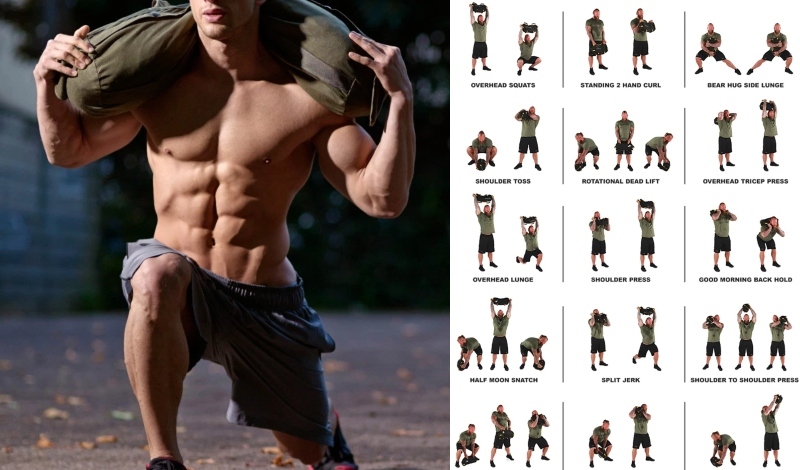 Swing the bag between your legs, dipping slightly, then raise it over your head and onto your shoulders. Lower into a squat, then take the bag off your shoulders as you come up and go straight into the next rep.
Lateral exercises are great for the knees because you are training a different angle. Side-to-side movements are also effective at creating stronger spines and glutes as well as more mobile hips. You can change the position of the bag depending on what level you are at. Put the bag on your shoulders, holding it securely at each end. Take a big sidestep and lower until you feel a stretch through your groin. Return to the start and repeat to the other side.